November 28, 2012 August 13, 2014 Categories Community, Events, Influencer Spotlight, Stylebirthday, Birthday Party, Celebrate, community, event, fashion, giveaway, One Year, Posh Party, poshmark birthday, Poshmark Turns One, San Francisco, SF Party, win1 Comment on Poshmark Is Turning One! 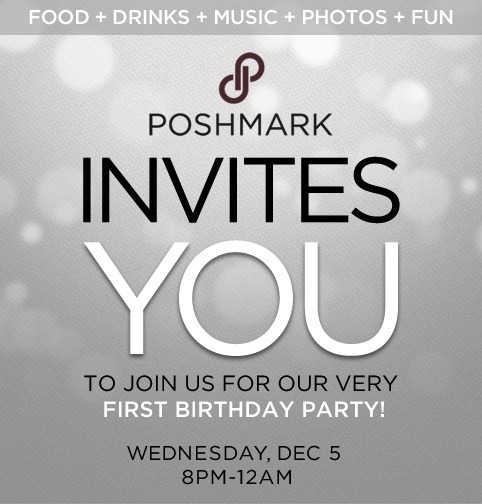 Next week officially marks Poshmark’s first birthday—woohoo! To thank our local community in the Bay Area for their ongoing support from the start, we’re throwing one BIG party in San Francisco on December 5th. We’ve accomplished so much in the last year (and have even bigger plans for the next! ), so we can’t wait to celebrate it all next week! BONUS: Are you in the SF Bay Area and want to attend the festivities? You’re in luck! We have set aside 10 extra tickets to this invite-only party. To enter to win a ticket, all you have to do is leave a comment on this blog post letting us know your Poshmark username and why you love Poshmark! We will randomly select the winners before the party. Can’t wait to dance, sip on bubbly, and celebrate with you! Previous Post Introducing Gift-Giving Parties! Next Post What is a Posh Party?